The number of farms keeps going down and the average age of principal operators continues to rise, but more farms are using technology and renewable sources, according to the Department of Agriculture's quintennial Census of Agriculture, which consists of 6,000,000 pieces of data on the national, state and county level collected in 2012 and rolled out Friday. There were nearly 100,000 fewer farms in 2012 than in 2007, with the number of farms dropping 4.3 percent from 2,204,792 to 2,109,303. Despite that decrease, farmers (mostly small ones) who sell directly to consumers rose from 136,817 to 144,530, an increase of 5.6 percent. The value of all agricultural sales rose from $292.2 billion to $394.6 billion, an increase of 32.8 percent. The average age of farmers rose from 2007 to 2012 from 57.1 years to 58.3 years, and is up from 50.5 years in 1982. But farmers have gotten more connected to technology. Internet use has increased from 56.5 percent of farms in 2007 to 69.6 percent in 2012, although 10 percent of farmers were still using dial-up. The number of farms using renewable energy has more than doubled from 2007 to 2012, up from 23,451 farms to 57,299 farms. Organic product sales also increased 82 percent from 2007 to 2012, from from $1.76 billion to $3.1 billion in 2012. Read the full report by clicking here. A preliminary report was released in February, and reports in March had information on minority farmers and the age of farmers. A report on Puerto Rico will be released in June, followed by reports in December on specialty crops and specialty crops in Puerto Rico. An African-American congressman in Mississippi used a radio interview over the weekend to accuse white Republican political leaders of racism for their treatment of President Obama, specifically for their opposition to Medicaid expansion under federal health reform, Geoff Pender reports for the Jackson Clarion-Ledger. "Second District Rep. Bennie Thompson accused Mississippi Gov. Phil Bryant and Senate Majority Leader Mitch McConnell (R-Ky.) of racism and called Supreme Court Justice Clarence Thomas an 'Uncle Tom' on a New Nation of Islam radio program." The move by the U.S. Fish and Wildlife Service to designate the lesser prairie chicken as a threatened species and the subsequent release this week of a proposed plan to protect the chickens has sparked controversy among conservationists, as well as farmers and ranchers. How the proposed plan plays out, and whether or not rules can even be enforced, are some of the main concerns. "We were unprepared for the hand-wringing, man-the-battle-stations reaction to the U.S. Fish & Wildlife Service’s announcement earlier this month that the chicken would be listed as 'threatened,' rather than the far more onerous designation of 'endangered'. In making its decision, the USFWS took into consideration a range-wide conservation plan developed over the last two years with input from representatives of industries that would be affected by the listing—among them oil and gas producers, farmers and ranchers, and wind farm developers. "The ruling was accompanied by the federal agency’s promise to develop a timetable and criteria for eventual de-listing. Implicit in that decision was the understanding that the conservation plan should be given a chance to work, and that the stakeholders would be given a chance to show their commitment to making it work. What we expected would be a declaration of victory by those stake- holders who dodged the endangered-listing bullet was instead a call to battle. "It was suddenly very clear that the only acceptable outcome to them would have been no listing at all—this, despite the fact that the prairie-chicken population is in rapid and precipitous decline. One of the most frequently-heard comments has been one questioning the civil and criminal penalties that can be assessed to those who willfully or knowingly harm either the chicken itself or its habitat. Those penalties are the muscle, without which any regulatory effort is ineffective." But enforcing the rules are nearly impossible, unless someone goes so far to the extreme that their actions can't go unnoticed, Brown writes. Sean Kyle, a wildlife diversity specialist with the Texas Parks and Wildlife Department, likened endangered species enforcement to the handing of speeding tickets. Lyle, who has been working for 22 years to keep the bird from getting listed, said that someone going a little over the speed limit won't get stopped, but "If you’re doing 118 mph in a 60 mph speed zone, the cops are going to stop you," Brown reports. "With millions of dollars in lobbying and a nationally organized movement using ordinary citizens, the meat industry beat back the Obama administration’s attempts to better regulate the chicken and beef industries. 'Big Meat' emerged from the battle stronger than ever, with firmer control of both producers and consumers, says author Christopher Leonard," reports the Daily Yonder, which excerpts part of Leonard's book "The Meat Racket: The Secret Takeover of America's Food Business." "The story of how Obama failed shows how the administration quickly backed down when corporate interests put up a fight, and how political operatives muzzled and undermined the very reformers Obama’s team installed after his election," Leonard writes. "It is a pattern that has played itself out in failed efforts to reign in the nation’s biggest banks or stop consolidation in the airlines industry, to take just two examples." "The failed attempt to rein in the big meat packers’ power also illustrates the remarkable level of influence that giant meat companies have in Washington, where they quietly shape public policy to their advantage through groups like the American Meat Institute and the National Chicken Council," Leonard writes. "Their well-orchestrated effort to beat back Obama’s reform efforts has arguably left them more powerful than they were when Obama entered office. And like many of the changes in America’s meat industry, it all played out under the public’s radar." Illinois is the least desirable state in which to live, although most residents have no plans to leave, according to a Gallup Organization poll that asked residents in all 50 states if they would leave if they could, if they were planning to move to another state within the next 12 months and what factors would make them seek residency in another state. The poll, which was conducted from June to December 2013 and included surveys from at least 600 adults in each state, found that 33 percent of U.S. residents said they would like to move to another state, but 86 percent said it's unlikely they will in the next 12 months. While 50 percent of Illinois residents said they would like to leave, 80 percent said it was unlikely they would move within the next year. Right behind Illinois was Connecticut, with 49 percent of residents saying they would like to move, followed by Maryland, 47 percent; Nevada, 43 percent; Rhode Island, 42 percent; New Jersey, New York and Massachusetts, 41 percent; Louisiana, 40 percent; Mississippi, 39 percent; and Indiana, Arizona and Georgia, 38 percent. Maine, Hawaii and Montana tied for having the most satisfied residents, with only 23 percent saying they would like to move. They were followed by Texas, New Hampshire and Oregon, 24 percent; Colorado and Minnesota, 25 percent; South Dakota, 26 percent; Wyoming, 27 percent, West Virginia, 28 percent, and Wisconsin, Iowa and Idaho, 29 percent. While many residents said they would like to leave, at least 79 percent of respondents in every state said it's unlikely they will move within the next 12 months, with more than 90 percent in Minnesota, Texas, Iowa, Maine and Vermont saying they have no plans to move in the next year. Most of the country's 47,000 miles of interstate highways run through rural America, even if most drivers are going too fast to appreciate it, or don't have the time to stop and visit, unless it's for a quick fill-up, a bathroom break and some fast food before they head back out on the road. But interstate drivers could soon be forced to slow down and take a closer look, if only for a few seconds, as they reach into their wallets for some cash to pay tolls. "The U.S. Department of Transportation on Tuesday asked Congress to end the prohibition on tolling existing interstate highways as a way of paying for their reconstruction, marking a major shift away from how the system has been funded for decades," Curtis Tate reports for McClatchy Newspapers. "The proposal is part of President Barack Obama’s $302 billion infrastructure bill aimed at addressing a looming shortfall in the federal Highway Trust Fund," Tate writes. "States are currently able to toll interstates only to add lanes, but many simply don’t have the funds they need to widen or rebuild the oldest sections of interstate, and nor does the federal government." A review of the film will appear later. "The precise average for the entire month was 401.25 parts per million as of Tuesday, he said, and that level had only reached the crucial 400 threshold for the first time during a single day a year ago before dipping slightly," Perlman writes. "Records from ice cores drilled in Antarctica reveal air bubbles trapped in the ice as long ago as 800,000 years ago and not one of those gas bubbles has revealed carbon dioxide levels higher than 300 parts per million, Tans said." "The incident also cast a bright light on the rapidly expanding rail transport of crude oil from the Upper Plains through Virginia — and downtown Richmond — to terminals and refineries in the Northeast, raising safety and environmental concerns all along the way," Michael Martz and Rex Springston report for the Richmond Times-Dispatch. Another rural hospital is closing in a Republican-led state that chose not to expand Medicaid under federal health reform. Haywood Park Community Hospital in Brownsville, Tenn., will end inpatient and emergency services on July 31, Tom Wilemon reports for The Tennessean. The 62-bed hospital will be turned into an urgent-care clinic that will treat minor illnesses and non-life-threatening injuries. Larry Cash, chief financial officer of Tennessee-based Community Health Systems, which operates or leases 208 hospitals in 29 states, "said Tennessee’s failure to expand its Medicaid program was a contributing factor for the decision," Wilemon writes. Cash told him, “It is a situation where we will continue certain services there but inpatient services can be done at our hospital there in Jackson better.” Jackson is about 31 miles from Brownsville. The Obama administration scored a major victory in its bid for clean energy when the Supreme Court on Tuesday "upheld the authority of the Environmental Protection Agency to regulate the smog from coal plants that drifts across state lines from 28 Midwestern and Appalachian states to the East Coast," Coral Davenport writes for The New York Times. The 6-to-2 ruling "will force coal plant owners to install costly 'scrubber' technology to curb smokestack pollution of smog-forming chemicals," Davenport writes. "Many owners have said the regulation would be so expensive to carry out that they expected to shut down their oldest and dirtiest coal plants." Placing blame on the Obama administration for destroying the coal industry, Murray Energy, one of the largest coal employers, announced Tuesday that it will terminate health benefits for 1,200 non-union retirees "who worked in mines Murray purchased one year ago" from Consol Energy, reports WTRF in Wheeling, W. Va. Benefits for salaried retirees, including medical, prescription drug and life insurance will end on Dec. 31. "Murray Energy’s inability to provide these benefits is, in part, due to the destruction of the coal industry, including our markets, by the Obama administration and its appointees and supporters, who have eliminated the livelihoods of thousands of coal miners, and their families, by the forced closing of 392 coal-fired electric power plants in America, now and in the immediate future," the company said in a statement. "Due to these action and devastated coal markets, Murray Energy is unable to support these benefits." A controversial pipeline project may never be built. The $1.5 billion Bluegrass Pipeline, designed to carry up to 400,000 barrels of natural gas liquids per day from Pennsylvania and West Virginia's shale-gas fields to the Gulf Coast, has been put on indefinite hold, with developers saying "it has not received the necessary customer commitments." 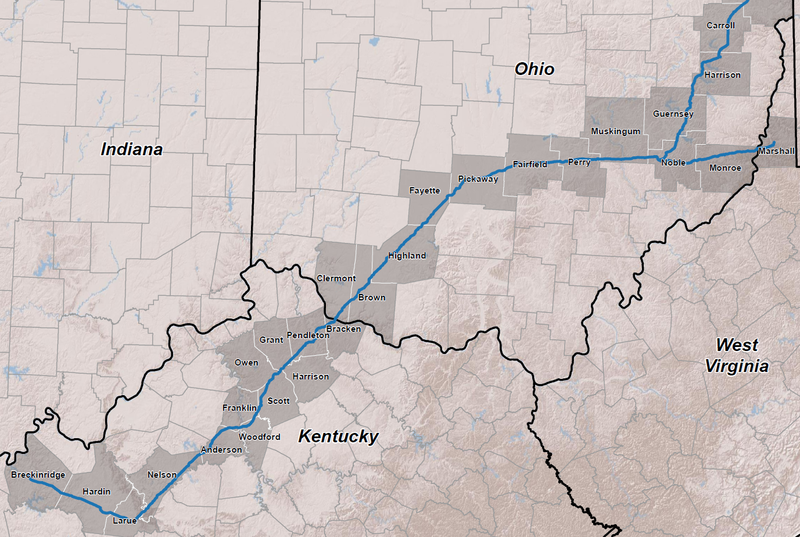 While the hold is indefinite, there is something of a deadline: "If Bluegrass Pipeline does not exercise its options for easements within the three-year term of the option, the easement will expire," Kayla Pickrell writes for the Midway Messenger in Kentucky, where there was concern about the pipeline's safety, especially in karst topography, and possible use of eminent domain to get right of way from unwilling landowners. Williams Companies, one of two partners in the project, said its decision "was not based on opposition, which played out at public meetings, in the courts, the legislature, news outlets and social media," James Bruggers reports for The Courier-Journal of Louisville. Marcellus Drilling News says future prospects for the pipeline are cloudy because of the Kentucky opposition, an adverse state court ruling (upheld on appeal) against eminent domain, questions about Williams' partner and competition from a more-or-less parallel pipeline that doesn't have to deal with landowners because it was built for Gulf gas fields decades ago and will now reverse its flow (as would most of the Bluegrass Pipeline, from Hardinsburg, Ky., south). Network neutrality, or "net neutrality," prescribes equal treatment for users of the Internet; there is no "fast lane." Companies cannot pay extra to have their web pages load faster, but that could change, and wouldn't be good news for rural America, Edyael Casaperalta writes for the Daily Yonder. The Federal Communications Commission said last week that it consider "new rules on Internet traffic that would allow broadband providers to charge companies a premium for access to their fastest lanes," as The Wall Street Journal reported. FCC Chairman Tom Wheeler said the FCC won't vote and release the rules until May 15, but would act with transparency, and Internet providers would not be able prioritize certain content or block any legal content. Some groups are not too confident the results will be favorable. The Daily Kos is even asking people to sign a petition. "The FCC will consider this "pay-to-play" rule on May 15th, so let's nip it in the bud now," the Daily Kos reports. The Washington Post noted in February that the agency has "a trump card" to hang over the head of Internet providers: reclassifying them "as regulated utilities under Title II of the Communications Act. Doing so would entitle the FCC to reinstate all the old rules about traffic blocking and discrimination that were just eliminated by the court." Net neutrality matters, but not many rural people have joined the discussion, which may be because rural and Native American communities still comprise the majority of those who cannot access telecommunications services, Casaperalta writes. Of the 19 million Americans who do not have access to fixed broadband networks, 14.5 million live in rural areas, and almost a third live in tribal lands, according to the FCC's latest Broadband Progress Report. "Net-neutrality advocates fear that without rules in place, big companies like Netflix, Disney, and ESPN could gain advantage over their competitors by paying ISPs to provide preferential treatment to their company's data," writes Brad Chacos for PC World. The net neutrality debate has been going on for years. In 2010, the FCC passed rules that earned them criticism from both the liberals and right-wingers. The Daily Beast's headline said that that ruling "boils down to one fact: there will soon be a fast Internet for the rich and a slow Internet for the poor." Meanwhile, the FCC also announced last week that it was planning to raise the standard download speed that can be called broadband to 10 megabits from 4 megabits. "This is a great step! But there’s a chance weaker net-neutrality rules will compromise the ability of rural communities to enjoy these faster speeds. What good are faster speeds if the information rural people want is stuck in the cheaper slow lane?" Casaperalta writes. Taking one-stop shopping to another level, Walmart customers will soon be able to purchase auto insurance while in the store or on the company's website. Through a partnership with Tranzutary Insurance Solutions LLC's AutoInsurance.com, the retail giant and one of the biggest rural businesses, will receive promotional payments while "AutoInsurance.com receives a commission for every policy that is sold," Anna Prior reports for The Wall Street Journal. "Officials are banking on a 373-page, five-state conservation plan to save the species," Janelle Stecklein reports for Community Newspaper Holdings Inc. "The plan attempts to protect the chicken and address conservation by balancing the nesting and mating grounds of the chicken with business and agricultural interests." The plan, "which has an enrollment fee of $2.25 per acre per year for industries, provides protection from 'take' and eliminates the typically long federal permitting process in habitat areas," Stecklein nots. "Farmers and ranchers, who have ideal nesting and breeding grounds, are eligible for annual payments of $20 to $40 an acre to incentivize the conservation and chicken-friendly practices." Not everyone is a fan of the plan, reports Frank Morris of High Plains Public Radio, which has studios in Garden City, Kan., and Amarillo, Texas. Norval Ralstin, who has thousands of acres with crops, cattle and wind turbines near Mullinville, Kan., told him government officials "almost think they can take over your property if you're not doing everything you can to make sure this species survives." Oklahoma Attorney General Scott Pruitt plans to fight the threatened-species listing, but "the real action is with the landowners," Morris writes. "If they don't agree to take payments to manage their properties in bird-friendly ways, the whole range-wide plan falls apart." Pruitt told Morris, "For the Fish and Wildlife Service to come out and say, 'Yes, we're going to classify the lesser prairie chicken as a threatened species, but we're not going to change anything,' seems to beg the question, then why did you take the step?" There is little probability that climate change is a natural occurrence, according to a study by Shaun Lovejoy, a physics professor at McGill University in Montreal. In the study, published in the online journal Climate Dynamics, Loveyjoy concluded that "natural-warming hypothesis may be ruled out 'with confidence levels great than 99 percent, and most likely greater than 99.9 percent,” the university says in a press release. "Rather than using complex computer models to estimate the effects of greenhouse-gas emissions, Lovejoy examines historical data to assess the competing hypothesis: that warming over the past century is due to natural long-term variations in temperature," the release says. "Lovejoy’s study applies statistical methodology to determine the probability that global warming since 1880 is due to natural variability." The study predicts, with the standard 95 percent confidence level, that a doubling of carbon-dioxide levels in the atmosphere would cause the climate to warm by between 1.9 and 4.2 degrees Celsius. "That range is more precise than – but in line with -- the IPCC’s prediction that temperatures would rise by 1.5 to 4.5 degrees Celsius if CO2 concentrations double," the release says. The study is behind a pay wall, but an excerpt can be found on the Cambridge University Press by clicking here. On Monday the Florida House passed a bill that would permit teachers to bring guns to school. The proposal is less likely to pass the Senate, which is more moderate. School employees would have to possess concealed weapon licenses and military or law enforcement experience. The bill would "require schools to hold drills to prepare for active-shooter situations," Kathleen McGrory writes for the Miami Herald. In the weeks after the Connecticut elementary school shooting, Republican Rep. Greg Steube brought up the idea, and the National Rifle Association agreed with the proposal. "The best way to stop a bad guy with a gun is a good guy with a gun," NRA lobbyist Marion Hammer said. Some parent groups, teachers and local school boards have protested, saying guns should not be permitted on school property. "[Putting] guns in the hands of school personnel is not the answer to ensuring the safety of all children," said Mindy Gould, who oversees legislative affairs for the state PTA. Steube's bill didn't make it through last year, and this year it incited a lively debate. "If you want to keep children safe, put forth the money from our surplus to hire resource officers," said Rep. Karen Castor Dentel, a Maitland Democrat. "I know Rep. Steube has worked hard on this, but arming teachers is not the solution. Funding our schools adequately is." However, Rep. Ronald Renuart pointed out that "We cannot afford to have resource officers in every school full time. Yet, we have very willing veterans who have been well-trained who can help us in this situation." Passing immigration reform should be easy, but a small group of House Republicans are blocking it, Agriculture Secretary Tom Vilsack (left) told reporters Monday. "Vilsack said the lawmakers, whom he did not name, fail to understand the economic impact that immigration reform could mean to the nation," Derrick Cain reports for Agri-Pulse, a Washington newsletter. Vilsack said, “The reality is that American agriculture is not performing at its maximum due to an inadequate workforce." While Vilsack didn't point fingers at any particular House member, "House Majority Leader Eric Cantor (R-Va.) and House Judiciary Committee Chairman Bob Goodlatte (R-Va.) have largely been standing in the way of movement of immigration reform legislation, supporters say," Cain notes. Goodlatte wants to replace the agricultural visa program that allows workers to stay for one year to one that allows 500,000 temporary agricultural laborers into the U.S. each per for up to 18 months. Others have said they don't trust President Obama to enforce border security, which Vilsack called "a lame explanation…a flimsy excuse,” Cain writes. Twenty-two senators, led by Sen. David Vitter (R-La.) sent a letter to Obama last week challenging the administration's enforcement review, saying it will lead to fewer deportations. Some states are restricting the use of the new painkiller Zohydro, "setting up a showdown with the federal government over who gets to decide the best way to protect public health," Michael Ollove reports for Stateline. Though millions of chronic pain sufferers could benefit from the drug, some officials worry that abusers will crush and inject it for a big high, will significantly worsen the painkiller abuse crisis they have been battling. Combating prescription drug abuse has been a focus in Kentucky for the past few years. U.S. Reps. Hal Rogers of Kentucky and Stephen Lynch of Massachusetts have introduced a bill to withdraw the Food and Drug Administration's approval, done though an advisory board voted 11-2 against it. A federal judge told Massachusetts officials that they cannot ban a drug that the FDA has declared safe and effective, but Gov. Deval Patrick is restricting its use. Vermont Gov. Peter Shumlin has taken similar measures, and the Ohio legislature is debating similar action. Twenty-nine state attorneys general, including Kentucky's Jack Conway, have requested that the FDA rethink its approval of Zohydro. "We're in the context of a very serious epidemic of opioid drug addictions and opioid deaths, and that's a public health crisis that has been growing over the last decade and half," said Michael Carome, director of the Health Research Group at the consumer organization Public Citizen. "The last thing we needed was another extended release opioid for treating chronic pain." According to Trust for America's Health's 2013 report, "6.1 million Americans abuse or misuse prescription drugs," and "Overdose deaths involving prescription painkillers have quadrupled since 1999, and now outnumber those from heroin and cocaine combined, Ollove reports. Zohydro is an opioid, and opioids are not only easily abused but are also unfortunately gateway drugs, influencing people to use heroin, which isn't as expensive. One advantage to Zohydro is that it is a single-ingredient, long-acting product, unlike other painkillers that were combined with acetaminophen, which can be injurious to the liver. Opponents are frustrated that the FDA not only approved the drug but also did not force the manufacturer, Zogenix, to create a version that isn't so easy to abuse. The company has said it is making such a version. "In the meantime, it said it has implemented other safeguards, such as compensating sales representatives for educating doctors, pharmacists and patients on the risks and benefits of extended-release opioids," Ollove writes. Through a series of graphics, the Post examines food insecurity in America, noting that the South, which is mostly rural, makes up 90 percent of highly insecure counties, "with the largest concentrations in the South Atlantic (Delaware, D.C., Florida, Georgia, Maryland, North Carolina, South Carolina, Virginia and West Virginia) and East South Central states (Alabama, Kentucky, Mississippi and Tennessee)." More than 1,400 rural organizations and advocates have sent a petition to Congress in an attempt to stop cuts to Rural Development programs in the Department of Agriculture's proposed budget for the fiscal year that starts Oct. 1, Sarah Mickelson reports for the Daily Yonder. "Proposed changes include a 60 percent cut in low-cost home ownership loans and over $150 million in cuts to grants that help small, rural communities provide potable water and waste disposal systems to residents." "Rural advocates argue that rural America’s community development needs are not a priority for the administration and urge Congress to reject the proposed reductions as 'unwise and unwarranted,'” Mickelson writes. "They warn that the president’s budget will only make it harder for low-income families, the elderly and persons with disabilities to access decent, healthy and affordable housing and will hurt struggling rural economies." Shaping our Appalachian Region is searching for ways to improve and diversify the economy of Appalachian Kentucky. SOAR work groups plan "to hold meetings in most parts of Eastern and Southern Kentucky this summer, to gather ideas for a strategic plan that will be written by the SOAR executive committee this fall," Al Cross, director of the Institute for Rural Journalism and Community Issues, reports on the Appalachian Kentucky page of The Rural Blog. "The groups had their first meetings last week at the annual East Kentucky Leadership Conference in Somerset, a site that gave both the long-held conference and the months-old SOAR a broader geographic base, and wove together some of the region's contrasting political threads," Cross writes. One of the most common ideas mentioned "was a need to overcome the divisions created by county lines." Other ideas centered around finding ways to promote the region's vast sources of tourism, agriculture, timber and livestock. Charles W. Fluharty, president of the Rural Policy Research Institute, who is acting as temporary staff leader for SOAR, told the crowd, "I've never seen so much progress or bipartisan commitment from the political establishment. The challenge is to translate that to the grass roots." SOAR, which "was launched in response to a steep decline in the region's coal industry," is a bipartisan effort led by Democratic Gov. Steve Beshear and Republican 5th District U.S. Rep. Hal Rogers of Somerset, Cross writes. Ron Crouch, a demographer with the state Workforce Development Cabinet, said "the economy of the Eastern Kentucky Coalfield has been diversifying for many years, to the point that coal now ranks only sixth in employment, with health care ranking first, and such categories as education and retail trade in between," Cross writes. The U.S. Department of Transportation said it will send a comprehensive package of proposals regarding rail shipments of crude oil to the White House this week, Timothy Cama reports for The Hill. "The proposals will include some options for improving the standards for tanker cars that carry crude oil, Transportation Secretary Anthony Foxx said in a blog post late Thursday." Last week Canada announced new safety rules for train cars carrying crude oil. A state regulator estimated that customers could expect to see their bills increase by more than $20 a month. Duke officials have countered with a cheaper option that would cost $2 billion to $2.5 billion and leave the coal ash in place at most sites. Under that option, "the coal ash would be air-dried, left in place and covered with a tarpaulin or membrane," Murwaski writes. Chris Ayers, executive director of Public Staff, the state agency that represents the public in utility-rate cases, "noted that a North Carolina utility’s environmental compliance costs are typically included in customers’ rates. He said it was too early to tell if the Public Staff would challenge Duke’s proposed costs, which the company would have to demonstrate are prudent and reasonable," Murawski writes. "Ayers told lawmakers that Duke could not be held to an environmental standard that did not exist when the pits were constructed a half-century ago."